The results of 78 local council elections in Victoria will emerge in the next few days. I imagine most residents have moved well past their civic duties to care. But in a time where people have lost sight of the mechanics of government (note the one-man fix-all du jour) it is worth touching on the impact of cities and municipalities. Local councils are rather underappreciated in Australia. Things like waste collection, animal management and parks maintenance are seen as mundane. Indeed councils turn up on our radar only when someone gets pinged for branch-stacking, corruption and bullying, or when officials turn 'colourful' like Salim Mehajer (Auburn) and Darryn Lyons (Geelong). Yet local councils are on the frontline of the many services we have come to expect in advanced societies. Families, in particular, benefit from these services. When I became a mum, with none of the family or cultural support I might have had in the Philippines, I found it comforting to have free access to a maternal and child health nurse. This would be the case for many in our highly diverse municipality. Moreover, Victorian councils administer around 90 per cent of immunisations due at school age. It runs like clockwork, from my experience, and it brings peace of mind. Local councils also establish and run libraries, which provide enriching activities for children (from baby 'rhyme time' sessions to school holiday workshops), as well as practical support for Australians from non-English speaking backgrounds, newly arrived migrants, under-resourced students, job seekers and pensioners. The suburban library has never been just a repository for books. It is one of the few inclusive, non-commercial spaces we have. Many other areas fall under council implementation: early childhood education and care; aged, disability and youth services; maintenance of roads and footpaths; recreational and arts facilities; planning and building permits. These may be far removed from national politics, but they constitute a form of housekeeping that probably makes a more immediate difference than the power plays, culture wars and legislative horse-trading that drive the news. This is not to say that local government is somehow purer than other levels of government. Its proximity to development decisions, for instance, draws all sorts of opportunists. Poorly thought out regulations can dent small businesses at the till. "As higher levels of government have become gripped by hyper-partisan politics and corporate interests, the reforms we need to thrive in the next few decades may well come from cities and municipalities." But unless you have lived elsewhere, where taxes and rates rarely manifest as a tangible and permanent benefit, it is easy to take councils for granted. I grew up in a town where potholes are forever, healthcare is ad hoc and libraries are private. The things that I see my local council do as a matter of routine are wild luxuries in other places around the world. Such competencies arguably measure the health of a democracy — it means that most of the money has not been lost to corruption and fraud. As higher levels of government have become gripped by hyper-partisan politics and corporate interests, the reforms we need to thrive in the next few decades may well come from cities and municipalities. Sunshine Coast Council, for example, will become the first local government in Australia to run a large-scale solar farm. The council pushed ahead with the project despite failing to acquire federal funding. It will be the fifth largest solar farm in the country, projected to supply all power for council infrastructure. It calls to mind other cities like Los Angeles, which is developing plans to switch 100 per cent of its energy to renewables. At ground level, the future seems more immediate and real. This means that local councils, as the first and best advocates of their communities, are well placed to lead the way. Cities are already showing that it is possible to bypass inertia at the top and get on with what is necessary and good for their people. It does not mean they should get a free pass; otherwise, they end up replicating the worst aspects of other levels of government. But it does mean that we could spare some of our attention to what goes on our neighbourhoods, including the small and boring things that make a tranquil life. We may find that some things still work in our democracy, despite the ineptitude of politicians. An article in the Labour History Melbourne newsletter Recorder in 2013 by Ainsley Symons, and a rejoinder by myself in a subsequent issue, refer to the problems facing under 14s using the Northcote (Victoria) Council library in 1954, where an autocratic City Librarian enforced a Regulation she had never read. 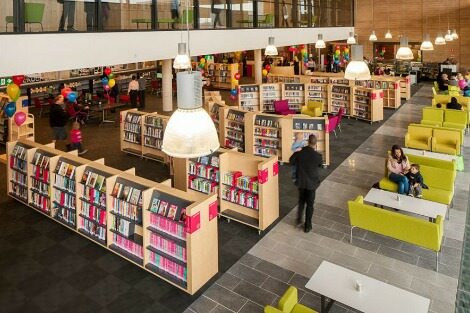 Books in the library said that it was open to residents and ratepayers who were over the age of 14. The actual regulation said use by under 14s was at the discretion of the librarian. Complaints to ALP Councillors, for almost all councillors were members of that party, fell on deaf ears. The poor quality of ALP councillors at the time was lamentable. Two Councillors, named Walsh and O'Leary, who joined what became the DLP in 1955 and lost their seats, were two of the better ones. One of the ALP Councillors is credited by Symons with the comment at an ALP meeting that only Italian immigrants, Communists, and homosexuals read books. The actual words used are probably not acceptable to this publication. Anti-intellectualism was just one of the observable traits among these ALP Councillors. I live in a beautiful regional area of NSW, where our local Council is a City Council. The largest town in the City is, naturally, the headquarters of our Council. But our town does have something important to offer: the Mayor, a Green, is one of us! All the interactions I've had with local Councillors and our current Mayor have been positive and I know they are hard-working and dedicated to our City. And wonderful libraries. Thank you for a well said article about Local Councils. You reminded me of so much that I valour about my local council. We are fighting to stay 'local' and not be forced to almalagate with other councils for all the reasons you so well expressed in your article. Thank you. Wonderful to read an article that has something good to say about Australia for a change. Fatima right on as usual! We have lived in the same Council area for 37 years and we could not speak more highly of the services we get, and are about to get now from the Council's Home Maintenance Scheme - they are marvellous! Seems to me that local government is the last level of government where democracy is still working. Where effective govt of the people, by the people, for the people is still commonplace. But state govts in Queensland, Victoria and now NSW have done their best to disconnect councils from communities by removing the "local" from local govt. Larger councils often seem to be party dominated, rather than community focused. As Fatima points out, the challenge is that when local govt is working well and reliably delivering quality local services, so many people take it for granted.. I live in the City of Yarra and strongly support the ongoing efforts of the 4 Libraries and the great team who are outstanding in the way they work to assist the community. Through their keenness and the variety and range of services they offer to the wide and diverse multi cultural groups they are a major contributor to many areas of growth and social enjoyment for the community.